A crash course on where to start your search for your next rifle. Step One: What Are Your Shooting and at what range? The first step into deciding which cartridge to pick, is deciding what you are shooting, and the expected ranges you will be shooting it at. Below are the recommended minimum energy levels a projectile should have on impacting various big game animals. Energy levels are only a rough guideline to get you into the right ball park, and should never be used to determine if a bullet should be used in a specific role. Terminal ballistics performance is the result of the construction of the bullet, not simply how heavy it is and how fast it is going. If impact happens at extremely high velocity, an improperly selected bullet can “detonate”, fragmenting into small pieces of lead and copper, all of which lack the energy needed to penetrate muscle and bone. throwing a 500 gram rock at a window vs throwing 500 grams of sand. The opposite is also true for impact velocities that are too low and a bullet will simply push through tissue, failing to deform and expand. It is through expansion and fragmentation that rapid energy transfer happens. The rapid transfer of energy causes a hydraulic shockwave which travels up the ribs, spine, and to the brain, knocking an animal unconscious while it bleeds out. A "Bang Flop" is the result of this. At A Glance: Fast muzzle velocities in a very low recoiling package, make most 6mm rifles very comfortable to shoot and quite forgiving within most hunting ranges encountered. They Generally lack hunting energy at longer ranges however. Suggested For: Deer 300m and under, pronghorn, long range coyote rifle, target shooting. At A Glace: High Ballistic coefficients result in very flat trajectories, very manageable recoil, and efficient energy downrange. Most 6.5mm cartridges are very capable at longer range shots on deer and perform very well at the range. Suggested For: Deer and long range target shooting. Elk and moose can be appropriate with special considerations to limitations. In Europe, 6.5x55 is very commonly used to kill moose. 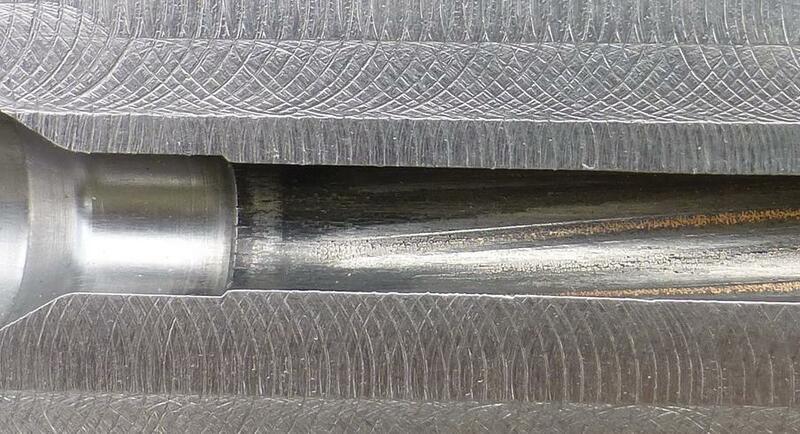 At A Glace: Modern heavy bullets have made the 7mm an extremely attractive option for big game hunting, while lighter bullets offer relief from recoil. Excellent for open terrain where fast flat shooting rifles excel. Not as strong in brush/short range. Suggested For: Long range deer and elk hunting. Moose with discretion to projectile construction and range. At A Glace: The general-purpose workhouse of most hunting camps, these cartridges are able to provide more energy then 7mm cousins for heavy game like elk and moose. Most cartridges in this ballpark have a moderate to high recoil, but are more forgiving to poor shot placement. They rely more on weight than speed to get their energy, and as a result make excellent shorter range bush rifles, and can be easy on meat. At A Glace: Excellent performance from large case magnums like the .338 Laupa are the ultimate in long range hunting. Smaller cases such as the .338 Federal are extremely efficient, high knockdown killers within hunting ranges. Suggested For: Long range hunting applications, short and intermediate range hunting applications requiring fast knockdown, such as small pieces of private property, or dangerous game. 87 grain 6mm, 115 grain 6mm, 140 grain 6.5mm, 140 grain 7mm, 190 grain 7mm, 155 grain 7.62mm, 210 grain 7.62mm, 300 grain .338. All bullets are Berger VLD Hunting. Velocity = Forgiveness. The faster a projectile moves through the air, the less time gravity and environmental factors have to act on it. A bullet leaving the barrel faster will fly in a flatter arc, then that same bullet leaving the rifle slower. These things together mean a faster bullet is more “forgiving” for errors made in range to target, high angle, and many others. A common guideline for determining expected barrel life is “overbore”. Overbore is the relationship between bore diameter and case capacity. A smaller bore, with more powder, burns out faster. The .308 Winchester family of cartridges demonstrates this perfectly as the .243Win, .260Rem, 7mm-08, .308Win, and .338 Federal, all use the same case. The .243 is a notorious barrel burner, with many competitive shooters rebarreling after only 1100 or fewer shots. The .308 Winchester is known to maintain accuracy for 3500 shots or more. Both cartridges have basically the same amount of powder capacity, however the .243 fires a lighter, smaller bullet, nearly 900fps faster then the .308 Winchester. This means it is more forgiving, and easier to shoot, but the cost of that ballistic performance is shorter barrel life and reduced energy. Recoil is the price that is paid for more energy and the easiest way to quantify recoil is by looking at muzzle energy. In rifles that weigh the same, muzzle energy is relative to recoil felt. A heavier rifle has more of a “push”, as it takes more energy and time for a heavy rifle to accelerate rearward (and slower to decelerate in your shoulder). A lighter rifle will feel more like a “punch”. If firing in large volumes, heavy recoil can cause the development of a “flinch” and also causes “shooter fatigue” rapidly. A large number of special “wildcat” cartridges are out there, and after playing around with standard cartridges, you may start to see the appeal of having a completely custom rifle with a chambering, that is perfectly tailored to your size, weight, and needs. While these “wildcats” often have amazing performance potential and can fill a role perfectly, the sacrifice is never being able to head into Walmart on the way out of town to pick up a box of shells. The .308 Winchester, 30-06 and others can be found in in back water gas stations, across Canada and the USA. Picking a mass-produced cartridge also reduces the cost of shooting greatly and I generally suggest new shooters or those on a budget look into .308Win because of this. The most accurate rifle ever built would not be any more useful then an SKS to someone who could only afford to shoot a single box of ammo a year.